No cost, all are welcome! 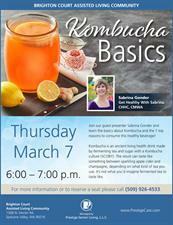 Join our guest presenter Sabrina Gonder and learn the basics about Kombucha and the 7 top reasons to consume this healthy beverage! , drink made by fermenting tea and sugar with a Kombucha culture (SCOBY). The results can taste like something between sparkling apple cider and champagne, depending on what kind of tea you use. It is not what you would imagine fermented tea to taste like.